There will always be style purists who say that dark, unsullied denim (preferably selvedge) is the only kind worth investing in for versatility and longevity. And while we agree, to an extent, denim has moved on a lot since tailor Jacob W. Davis and dry-goods salesman Levi Strauss patented the rivet in 1873. The 20th century’s most iconic garment – the blue jean – is overripe for designers to experiment with and subvert. And right now they’re doing it in their droves. Fear not, the bootcut isn’t making a comeback, but to ensure you’re not lagging behind we’ve spun a handy new-season guide covering the denim trends you need to know for the months ahead. Two words guaranteed to give Justin Timberlake chills right down to the bone marrow. Double denim isn’t the easiest trend to pull off – and when it goes wrong it, boy does it go wrong – but get it right and you’re looking at a massive pay off. It’s the menswear equivalent of a handstand press-ups or beef Wellington; only the pros can do it. The majority of your efforts should be focused on ensuring both denims are visibly different. Similarly, if wearing two blue washes, break things up with a white tee or grey sweatshirt – for perhaps the first time in menswear history, a blue knit or T-shirt isn’t the safe option here. You’d have to have been living under a soundproof rock not to notice that the nineties are all over men’s wardrobes right now. And denim is where the decade is enjoying its second wind most enthusiastically. The hallmark of this denim trend is a looser fit and a pale finish, so you need to think about the cut and colour of the kit that sits alongside your throwback threads. What this means in practice is that nineties denim jeans feel most at home with colour-block staples like sweatshirts and hoodies, with dark shoes thrown in to add a little visual weight to your bottom half. White jeans can still fill men with trepidation, especially in the season of barbecues and sitting on grass. But learning how to wear them without looking like a Eurotrash banker will not only save you from sweltering in black during the height of summer, it’ll also enhance any tan you worked on long into autumn. As well as the fit, which should be neither too skinny nor too wide, the secret to pulling off the look is in seeking out off-white rather than stark shades and steering simple and classic with the rest of your ensemble. Feeling the heat from athleisure’s blazing success, jeansmakers have been changing tack in recent seasons, introducing cropped styles that give a leg-up to what’s below. Now though, after several years of pinrolled jeans, menswear’s best-dressed are turning to the turn-up en masse, and for good reason. “By turning up the hem of your jeans, you add a completely different shape to your overall look,” says Abraham. “Because the hem of most jeans never usually sits perfectly above your ankle, a turn-up stops them bunching up above the shoe and exposes a bit of ankle, giving more of a tapered look.” So turn-ups aren’t just an exercise in adding interest to a look, they’ll stop cankles in their tracks, too. Turn-ups work best on rigid denim that will more easily retain folds. Try it with a pair of indigo selvedge jeans before finishing with rugged worker or Chelsea boots while it’s still cold, then sneakers when your ankles can handle the breeze. As with any enduring men’s staple, each season means subtle tweaks to a winning formula. But not even the biggest denimheads saw dad denim coming. Unsurprisingly, a lot can go wrong with this trend. Think of that loose, slightly faded pair your old man wears when he’s cutting the hedges and you’re on the right track; think Simon Cowell and you’ve gone one step too far. Rewind immediately. 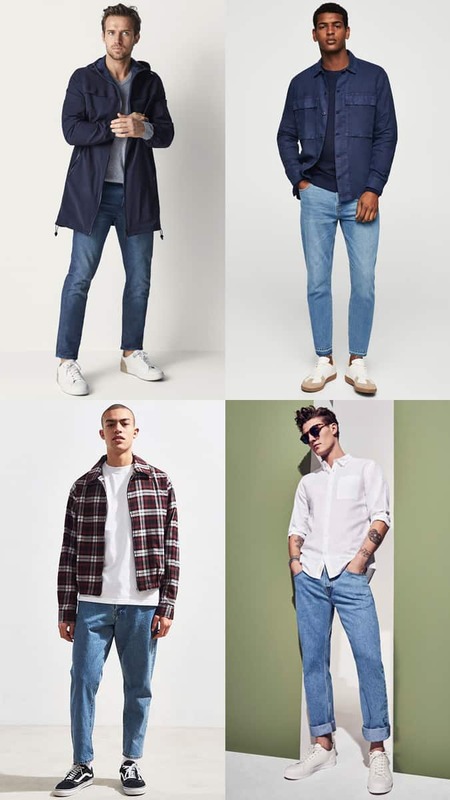 “The resurgence of dad denim is one that’s been championed by high-end designers – it’s all about an unfussy, unpretentious look, even if the price tag suggests otherwise,” says Reiss brand stylist Paul Higgins. Fortunately, the high street has also muscled in with affordable styles, so you don’t have to drop a mint to look intentionally normal. It’s a denim shade that works particularly well with normcore stablemates like boxy overshirts and colour block tees. In short: if it looks relaxed and basic, you’re doing dad denim right. Just leave the dance moves at home. We have some distressing news (at least for the purists): the distressed trend is sticking around for another year. However, when handled with due respect, it doesn’t have to look like a case of too much money, not enough taste. “This season’s distressed denim comes in all forms of ripped, bleached and raw edging,” says Hayley Bushell from the River Island Style Studio. That’s not your cue to try out every type at once, mind. Assuming you don’t want to look like Aerosmith frontman Steven Tyler circa 1984, avoid well-ventilated examples that are more holes than jeans. Keep everything else simple and balance them out with smart-casual pieces up top. 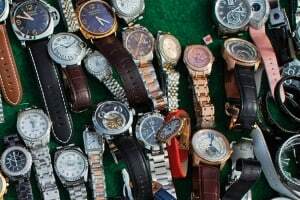 4 How Much Should You Spend On A Watch?